Facebook is a marvelous thing. I've been able to catch up with old friends--friends from grade school and college, 4-H camp, and from all five of the states I've lived in since college. Lately, two different friends asked me if I knew anything about making t-shirt quilts. Honestly, I've never made one myself, but when I managed the quilt shop in Florida (which I ought to blog about sometime--it was a GREAT job), I picked up a lot of knowledge about it. Sunnie Malesky taught the class for us and I was always able to pick up tips to pass along to customers when they needed advice between classes. But as for those friends that asked, since they can't head to Florida for one of Sunnie's classes, I've passed along those tips to them. This week, Cathie Filian blogged about making a t-shirt quilt. 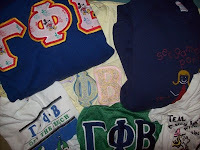 As I was trying to get rid of extra stuff in my house, I ran across sorority letter shirts and tee's and sweatshirts from date parties and such. I can't donate them; I thought about making tote bags out of them a while back but didn't know if the young women at my college sorority house would use them. But now it seems like the concept of a t-shirt quilt is coming at me from all angles. Though I have to go through the drawers to see how many I have and what parts of them are salvageable, I might have a good start. Now I'll just have to use Facebook to round up more from those years from Gamma Phi Beta sisters who are savers like me. Oh yeah, and then actually put it together. But no deadline, so I've got time. I have soooo many "memory" t-shirts filling my drawers. I can't wear them anymore or part with them. So they're just hogging space. What a great way to preserve the memories in a more useful way! This sounds like a great idea. I'm also guilty of keeping t-shirts for sentimental reasons! I love t-shirt quilts! I have made 3, one for each of my kids when they graduated high school!